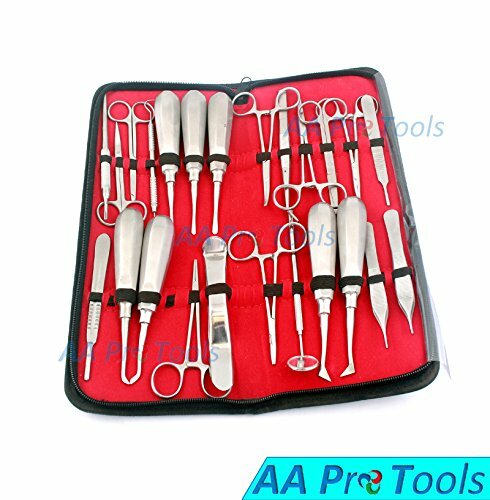 NEW O.R GRADE 37 PIECE BASIC ORAL DENTAL SET KIT SET INCLUDE : 1 EACH DENTAL ELEVATOR MILLER APEXO RIGHT 1 EACH DENTAL ELEVATOR MILLER APEXO LEFT 1 EACH DENTAL ELEVATOR CRYER RIGHT 1 EACH DENTAL ELEVATOR CRYER LEFT 1 EACH STITCH SCISSOR 4.5" 1 EACH MOSQUITO FORCEPS 5" STRAIGHT 1 EACH MOSQUITO FORCEPS CURVED 5" 1 EACH ADSON FORCEPS SERRATED 4.75" FINE POINT 1 EACH ADSON FORCEPS 1X2T 1 EACH DENTAL ELEVATOR FLOHR LEFT 1 EACH DENTAL ELEVATOR FLOHR RIGHT 1 EACH DENTAL ROOT TIP ELEVATOR STRAIGHT 2MM 1 EACH DENTAL ROOT TIP ELEVATOR STRAIGHT 3MM 1 EACH DENTAL ROOT TIP ELEVATOR STRAIGHT 4MM 1 EACH DENTAL EXPLORER PROBE 1 EACH DENTAL EXAMINATION MIRROR 1 EACH DENTAL COTTON PLIER 1 EACH T.C WEBSTER NEEDLE HOLDER 6" 1 EACH KELLY FORCEPS STRAIGHT 5.5" 1 EACH KELLY FORCEPS CURVED 5.5" 1 EACH MINNESOTA CHEEK RETRACTOR 1 EACH OPERATING SCISSORS SHARP BLUNT STRAIGHT 5.5" 1 EACH SCALPEL HANDLE # 3 ROUND 1 EACH SCALPEL HANDLE # 4 1 EACH SCALPEL HANDLE # 3 REGULAR 5 STERILE SURGICAL BLADE # 10 FOR # 3 HANDLE 5 STERILE SURGICAL BLADE # 20 FOR # 4 HANDLE 1 EACH T.C IRIS SCISSORS STRAIGHT 4.5"
AA PRO TOOLS PRODUCTS OFFER A HANDMADE TOUCH TO EACH INSTRUMENT. If you have any questions about this product by AAPROTOOLS, contact us by completing and submitting the form below. If you are looking for a specif part number, please include it with your message.